SILVER SPRING, MD—In an effort to get Americans to at least go through the motions of a healthier diet, the Food and Drug Administration announced Wednesday that it is now recommending individuals consume three servings of foods every day that simply include the word “fruit” on the box. 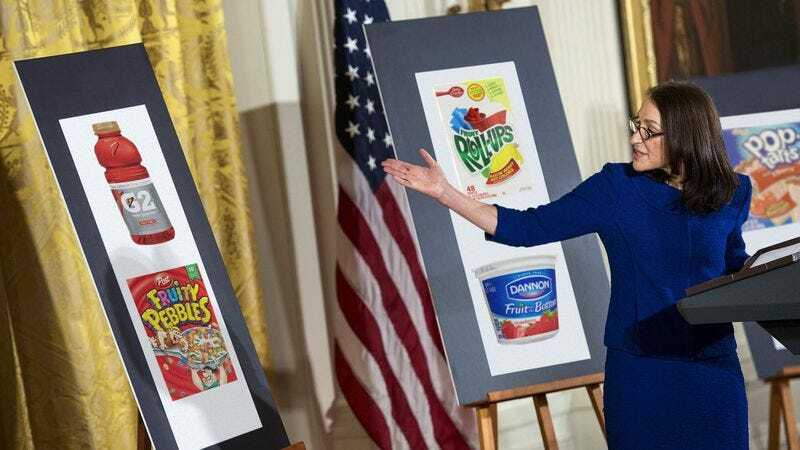 “Though we have in the past advised eating a minimum of three pieces of actual fruit per day, it is now acceptable to eat any food labeled with the word ‘fruit,’ including variations such as ‘fruity,’ ‘fruit-a-licious,’ or ‘fruit-blasted,’” FDA commissioner Margaret Hamburg told reporters, also noting that sweetened cereal or gummies shaped like fruit are entirely permissible under the agency’s new guidelines. “If it smells somewhat like fruit, or even if there’s a cartoon strawberry or orange on the wrapper, that’s sufficient at this point.” The FDA’s new recommendations are expected to be followed up by other guidelines under which anything successfully chewed and swallowed can now be considered a vegetable.